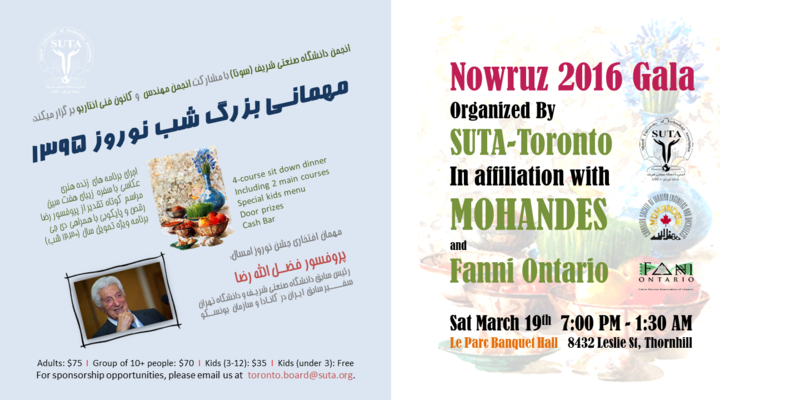 You are cordially invited to join us to celebrate Iranian New Year "Nowruz" on Sat, March 19th 2016 at Le Parc Banquet Hall (Leslie and HWY7). This event is organized by Sharif University of Technology Association in affiliation with Mohandes and Fanni Ontario. Except of eventbrite, you can buy your tickets through SUTA, Fanni and Mohandes organizations or alternatively by email money transfer to kanoon@mohandes.com. If you are a paid member of Mohandes, you are also eligible to get $5 discount for up to 2 tickets by March 10th. For discounted tickets, please contact Mr Kazemi at (416) 564-7664 by March 10th. Please email SUTA BOD at toronto.board@suta.org for more information.